I received a free copy of Faltering Ownership and The Writer's Jungle. I was compensated for the time spent reviewing these products & writing this post. I was not required to write a positive review. All opinions expressed are my own. Writing is one of those subjects that causes many homeschooling moms anxiety and sleepless nights (this mom included!). But with some well-chosen materials like the resources available from Brave Writer, you can teach writing with confidence. TJ and I have been using a few different resources this year. Take a look at how I'm teaching writing with Brave Writer. Brave Writer is more than just a set of systematic lesson plans for teaching writing. It's really a lifestyle - including so much more than just writing assignments. 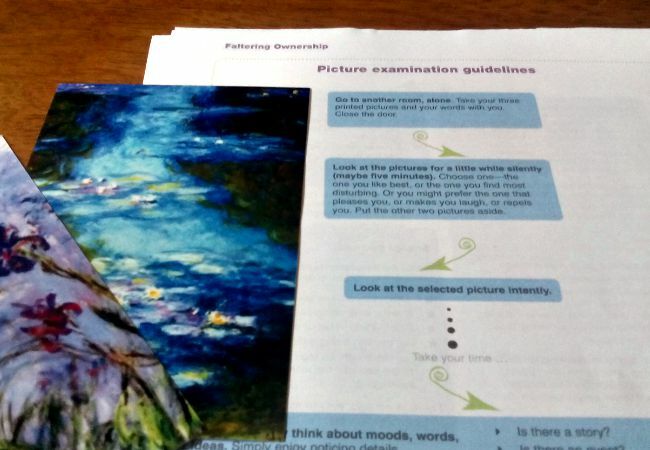 When you use the full program you'll find art study, Shakespeare, poetry, literary discussions, and so much more. 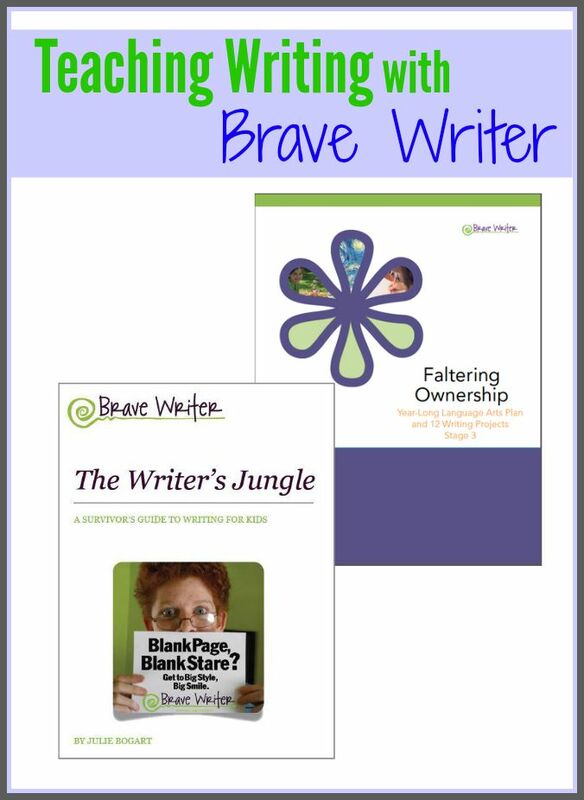 We've been using a few different resources from Brave Writer this year, including The Writer's Jungle and Faltering Ownership. The Writer's Jungle ($79 for the digital version) is the homeschool moms teacher's manual for teaching writing with Brave Writer. It's chock-full of helpful advice about teaching writing for children of all ages. The author, Julie Bogart, encourages parents to work on the assignments as they read through the text, something that you definitely shouldn't skip. The Writer's Jungle is divided into 17 chapters (216 pages) that breaks down the writing process, provides plenty of advice for creating assignments, and includes a very helpful appendix with lesson plan ideas (be sure to check out the sample at the link above). The layout is very unique - with a wide margin that includes even more tips and advice from Julie and homeschool families that have used the program. I found The Writer's Jungle very inspiring - it really breaks down the steps of learning to write in a thoughtful and creative manner. I am a logical thinker, which is alright for teaching basic essay skills, but I find creative writing very difficult to teach (and it's something my daughter really enjoys). So The Writer's Jungle stretches my thinking and teaching skills to cover various aspects of writing in more creative ways. It's definitely a must-read for moms who struggle with teaching writing. While I used the program to work specifically on creative writing skills, Brave Writer covers a myriad of topics throughout their programs - paragraph and sentence structure, essays and other forms of academic writing, and even SAT prep - all taught at the appropriate levels. If you want even more hand-holding for teaching writing with Brave Writer, you'll want to check out the Home Study Courses. We've been using Faltering Ownership ($79 for the digital version), which is perfect for ages 11-12. It provides 12 different month-long writing projects and a semester-length report. It's a full-color digital e-book that's easy to read and adapt to your own needs. The first section provides a great foundation for including art, poetry, and other elements into your homeschool - the Brave Writer Lifestyle and includes a look at the necessary components for a complete language arts course. The Oral Language section discusses the need for incorporating oral presentations into the writing program - something that is important for children at this stage. The last section is the meat of this guide - with 12 writing projects (each one is 4 weeks long) that also includes a calendar for each that incorporates all the elements of the Brave Writer lifestyle. Teaching writing in the middle school years can be difficult - kids want to be more independent but they aren't really ready for complete independence. Julie Bogart understands that and incorporates assignments that will appeal to kids. You'll also find a great series of audios about those various stages if writing skills at the Brave Writer blog. We really enjoyed using the first month's writing project - TJ loved collecting interesting words around the house. The focus of the first month is words, words, words - with lots of fun ideas that will inspire your kids in their creative writing. They'll collect words, tape them all over the house, sort them into piles, study art work, and create poetry. Lots of creative stuff going on! Faltering Ownership is perfect for the homeschool mom that is looking for creative ways to incorporate writing skills into her children's schedule. It's filled with innovative ideas that will give your kids a taste of independence while they work on honing their writing skills. If you have trouble incorporating creative writing into your homeschool day, you will want to take a look at Brave Writer and the Home Study Courses that correspond with your children's ages. We are enjoying using different elements of the Brave Writer programs. One of our favorites has been editions of The Arrow - literature guides for various books. Incorporating the guides along with Faltering Ownership is very simple and works well for us. Teaching writing with Brave Writer and Faltering Ownership has been so easy and enjoyable - it's easy to teach and provides plenty of creative opportunities for kids who are ready to be more independent.